The scoreboard doesn't tell the story of this game. In almost every respect, it was a one-sided slaughtering. ...in the season opener....with 10 new starters. Take away the odd illegal man downfield call which negated a touchdown, the two gift-wrapped pick-sixes...one which was a fluke and the other simply an overthrown ball...and this one isn't even close. I suspect Florida wouldn't have seen the endzone at all without those two gifts. Florida, to their credit, took advantage of their opportunities that Michigan gave them en-route to a frustrating 17-14 halftime lead. The second half began with a 10-play, 75 yard touchdown drive that put Michigan ahead for good. From there, it was all Don Brown and the Michigan defense. Michigan held Florida scoreless in the 2nd half, 101 total yards, -5 rushing yards and 1 for 7 on pivotal 3rd downs. Backup QB Malik Zaire was on the run the entire half, trying to create something out of nothing, with expected results. Michigan's defense, with mostly 3-man rushes, odd blitzes and misdirection everywhere, kept Florida OC Doug Nussmeier guessing all afternoon. LB Devin Bush led the way for Michigan defensively, but he was far from the only standout. Mo Hurst, Chase Winovich and Rashan Gary all had themselves a game. Maybe the most surprising thing defensively was the athleticism and playmaking ability of guys like David Long, Brandon Watson, Lavert Hill and Tyree Kinnel in the Michigan's secondary. Not only did they force numerous breakups, but many coverage sacks and pressures all day. Offensively, Michigan experimented with John O'Korn in the 2nd quarter, which, we were told was the plan going into the game. Timing seemed suspect as his appearance immediately followed Speight's 2nd pick-6. At halftime, Speight said, both Harbaugh and Pep Hamilton said his next move was going to be "crucial"...which Speight after the game, "I made sure it was positive". It was. Speight was mostly hit and some miss in this game, but ultimately did enough to control the offense and hit key passes at critical times. It's clear he didn't play his best game. Maybe the star of the game was Michigan's freshman placekicker, Quinn "Wild Thing" Nordin who hit kicks from 25, 55, 50 and 30 yards out while just missing from 52 and 32. Just goes to show why Jim Harbaugh went to such great lengths to woo him away from Penn State during his recruitment. First games are often marked by mistakes and special teams blunders. Michigan gave up a quick 14 points off turnovers, but thanks to a stout defense, was able to make back 13 points off of turnovers going Michigan's way. Ultimately, defense won the day for Michigan, which seems like could be this team's MO for the rest of the season. 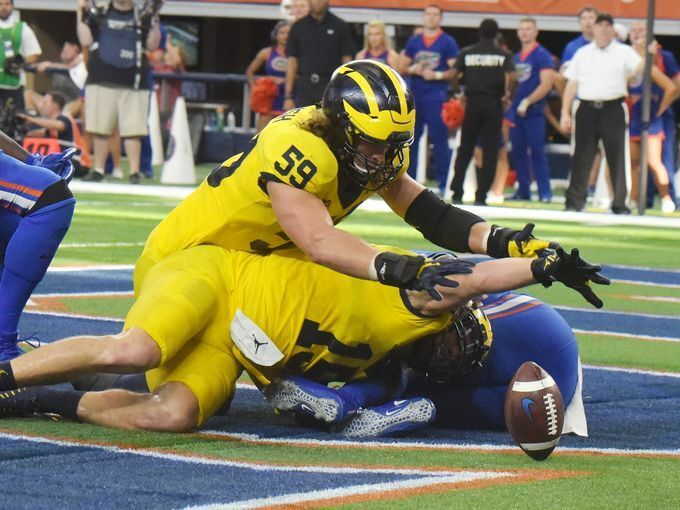 The offense has some work do, but this Florida defense was great last year, so this was a true test for Michigan's offense which is trying it's hardest to be a run-first beat you into submission type of unit. This was a big win for this team, who's schedule sets up nicely for a good start to the season, and most importantly, much needed time to find out what works, and what doesn't. The entire Michigan defense gets this honor this week. Florida was unable to really anything all day thanks to a stifling front that showed speed Michigan fans have never seen from a defensive unit...something Florida was not ready for at all. The second half, Michigan put the hammer down on a completely overmatched Florida team. Well of course the back-to-back pick-6's, plus the partially blocked punt was a momentum swing no one could've seen coming. Up 10-3 and seemingly moving the ball at will, Michigan mistakes were exactly what Florida needed to remain in this game. The lowest point of the game, for me, took place after the interceptions when John O'Korn came into the game. I was not, and am still not a fan of this at all. I get you're trying to calm down Speight and maybe give him a break, but it also sends a message of no confidence to your starter...or at the very least, a short leash. Grant Perry's football spin early in the 2nd quarter was a strong nominee for worst of the game, FWIW. Did he do it again at the end of the game as well? His 114 yards on 11 carries led the way for Michigan on the ground (a nice 10.4 ypc). The senior running back had a nice spring game and carried that over to the opener with multiple pivotal runs on 3rd downs that extended scoring drives. Michigan has a 3-headed running game monster with Isaac, Evans and Higdon, but I think Isaac looked the best out there yesterday. Led the team with 7 total tackles, 3 tackles for loss and 2 sacks. He was incredibly disruptive all day, making plays mainly in the Florida backfield where he set up shop all afternoon. His speed and agility combo is something we haven't seen from a Michigan linebacker since, well...Jabrill Peppers I guess...so nevermind. Bush had a day, simple as that. Excited to see him develop this year. All due respect to long snapper Cameron Cheeseman who looked right at home in the maize uni, have to give the game ball to sophomore Nordin. His kicks were absolutely clutch...maybe none more than the 55 yarder in the second quarter which stopped the bleeding and gave Michigan some much needed momentum after the Florida comeback. Not even close here. The story of this game was Michigan's defense. Replacing 10 starters seemed to not be an issue for the seasoned coordinator, who's year 2 at Michigan looks brighter than year 1...which given the talent he lost a year ago is truly saying something. The speed, my God, the speed. It's going to be a fun year!